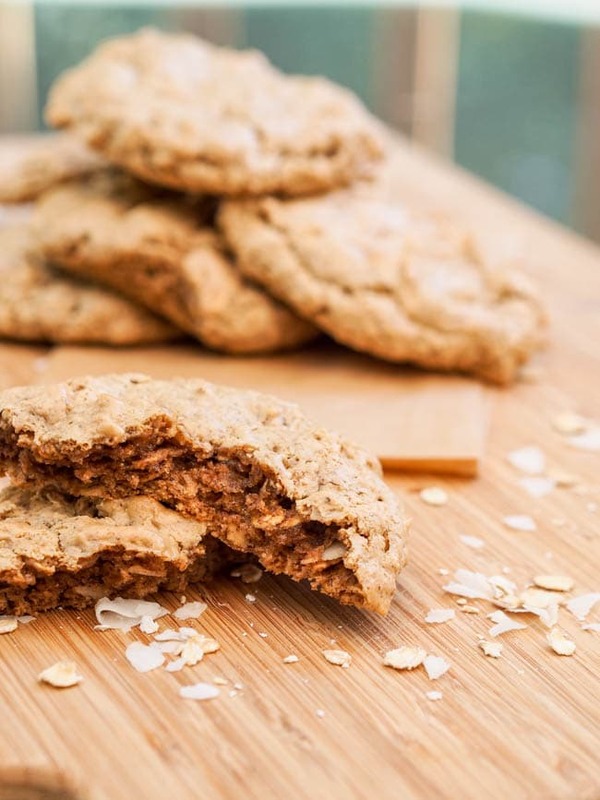 Gluten Free Almond Butter Oatmeal Cookies are entirely flour free, made with whole oats, almond butter, coconut chips and simply brimming with comforting flavors. Just sweet enough. Are you surprised to see a cookie recipe on here? And not just any cookie recipe but gluten free almond butter oatmeal cookies with coconut flakes? I know, I pretty much never post cookie recipes anymore. I used to. I really did. There was a time when I was always baking cookies for D, back when we still lived in DC. There were the heath and walnut cookies (my fave), Reeses cookies, peanut butter cookies, while chocolate cranberry cookies, etc. Now that I think of it, there used to be a decent amount on here. And I know I’m not supposed to say this, but lets face it, I don’t really love cookies. I meant they’re okayyyy. In a moment of real weakness I might even grab one or two. But generally if there’s a bowl of popcorn around you can safely bet on me running away with that bowl, most likely using the scent of freshly baked cookies as a decoy to keep you away from my salty and crunchy popcorn. You know who I really bake cookies for? It’s everyone around me. I love to watch people eat food that they love. I love it so much that I will literally whip up an entire batch of something that I would never make for myself. It’s that ability to make someone’s day with a warm and freshly baked cookie that really gets me baking. That alone is enough. And the fragrant aroma of course. There simply is no kitchen scent like the cookie baking perfume. It fills the air and spreads good vibes all around. Specifically oatmeal cookies too – they give off a completely different scent than chocolate chip cookies for example. While I used to accept most of my cookie baking requests from D, this one actually came from my mom. She’s not a traditional chocolate chip cookie lover so I knew her request would be a bit more out of the box. In her childhood she used to eat oatmeal cookies, so that’s what she asked for. She wanted them to be more on the crisper side, not like your standard soft and chewy chocolate chip cookie so I set off to work getting the recipe ready for her. 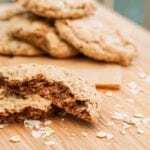 No chocolate needed in this almond butter oatmeal cookies recipe (though I supposed if you wanted to you could drizzle some melted dark chocolate on the cookies themselves or even dip them into some melted dark chocolate). Just whole gluten free oats, almond butter, eggs, vanilla extract, brown sugar, coconut chips and baking soda. 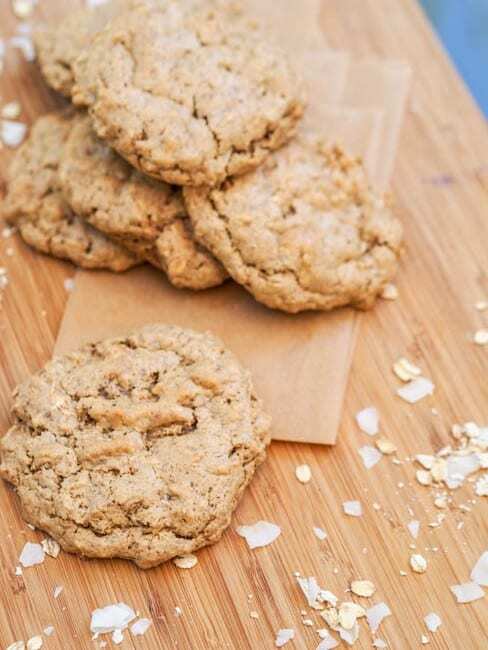 Seven ingredients is all you need to whip up a batch of these gluten free oatmeal cookies. The almond butter gives them a nice nutty dimension and coconut flakes lighten up the flavor. Overall delicious light and (almost) healthy almond butter oatmeal cookies ready in 35 minutes or less. If you make these almond butter oatmeal cookies let me know what you think in the comments below! Gluten Free almond butter Oatmeal Cookies are made with whole oats, almond butter, coconut chips and simply brimming with comforting flavors. In a large bowl combine almond butter, eggs, vanilla extract and brown sugar. Beat until smooth. To the same bowl add oats, coconut chips and baking soda. Mix with a spoon until combined. Line baking sheet with parchment paper and form 12-15 cookies out of the batter. Bake 10-15 minutes depending on cookie size. What?? How can you make delicious looking cookings like these and not be all over them? Or maybe I am the weird one. Maybe I have an unhealthy relationship with cookies, especially ones with oatmeal! I could definitely eat more than my share of these. And I totally blame my daughter for it. Or nursing, for that matter. When she was a newborn I had that intense urge to eat every time I was feeding her. Even in the middle of the night! Oatmeal cookies were my fuel then, and I still LOVE them now. I know right? Yep, I’d always rather grab a bowl of popcorn instead! That’s interesting about your food cravings while nursing! Thanks! Isn’t it so great just to bake for others knowing how much they looove it? I like all the ingredients in this cookie recipe. I can see myself eating this for breakfast. Right?! I won’t tell anyone! I like eating cookies, but I don’t make them often because I have zero will power 🙂 These couldn’t be easier to make could they? And it’s all pantry ingredients which is very dangerous!! Haha yes will power can be a problem around dessert but these are practically healthy! I love everything except I don’t eat eggs. I am born. Into lacto vegetarian family who’s debating going vegan in near future. What can I sub instead? You could try making a flax or chia egg. For the equivalent of 1 egg, combine 1 tablespoon of ground flax seed with 3 tablespoons of water. Stir, and refrigerate for 5 minutes, then use in place of an egg. I have not tried this recipe with a flax egg but have used flax eggs in vegan banana bread and found that they worked well. Hope that helps! I made the gluten free oatmeal cookies with almond butter and coconut. Not impressed. Dry, chewy, pretty much flavorless, bland. Will not make these again, waste of ingredients and time. If I need to make these without the coconut should I add something to replace it? More oatmeal or slivered almonds maybe? Yes feel free to try adding more oatmeal or almonds instead. Let me know how these turn out! Can I add something else besides coconut? If you are not a fan of coconut you can omit the coconut flakes.